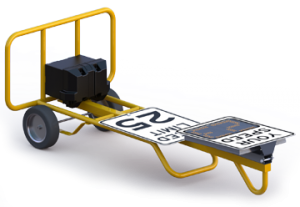 The TraffiCalm Portable Series now offers Dolly Mounted Radar Driver Feedback Value Signs. The sign that’s included with this package is the 9″ Portable Driver Feedback Sign (Value). This economical and portable solution can help increase driver speed awareness and road safety. The bright 9” characters can be seen from up to 450’ away, and improve driver speed awareness on the neighborhood streets where so many small accidents occur every year. TraffiCalm Value signs are designed for situations where drivers need to simply be alerted of their current speed but the additional data collecting and screen programming capabilities of the iQ Series of Driver Feedback Sign are not necessary. TraffiCalm Driver Feedback Signs are manufactured in the USA in an ISO 9001:2008 certified facility, meeting and exceeding industry standards and state testing requirements. 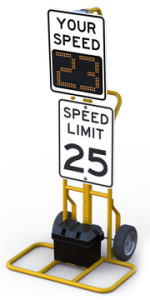 TraffiCalm signs are unmatched in durability, accuracy, ease of use and affordability. Includes a 75 Ah, Group 24 Battery for several days of sustained operation. 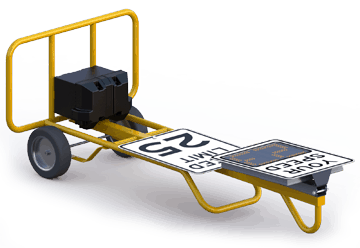 Package Includes: Driver Feedback sign, 18″ x 24″ Static Speed Limit Sign w/numerical placards, wheeled dolly, IR remote, 75Ah Group 24 Battery, battery box, and wiring.